Today we are celebrating Annakut at home. The whole community of friends and relatives eagerly wait for this puja at our home. Annakut is celebrated on the 1st day of Gujarati new year and also called Bestu Varsh. The day as per Hindu calender of the Vikram era is Kartik sud 1. As Hindu year comes to an end, families come together to celebrate one of the most sacred and important festivals, Diwali. Traditionally this time of the year also coincides with the completion of the harvest. Young and old join together to collect God’s harvest of bountiful blessings. As an offering of gratitude to God for his blessings, the new harvest is first used to cook exquisite foods for the Lord. Since may be more than hundred years Annakut is celebrated at our home. We have almost 150 odd close friends over for Prayers and then to take prasad(meal). It is said the 56 delicacies are made but if I am not wrong almost 75 odd things are cooked and everything is home cooked. And all those who have enjoyed this delicacies over the years can vouch that all the food cooked is delicious and tasty. 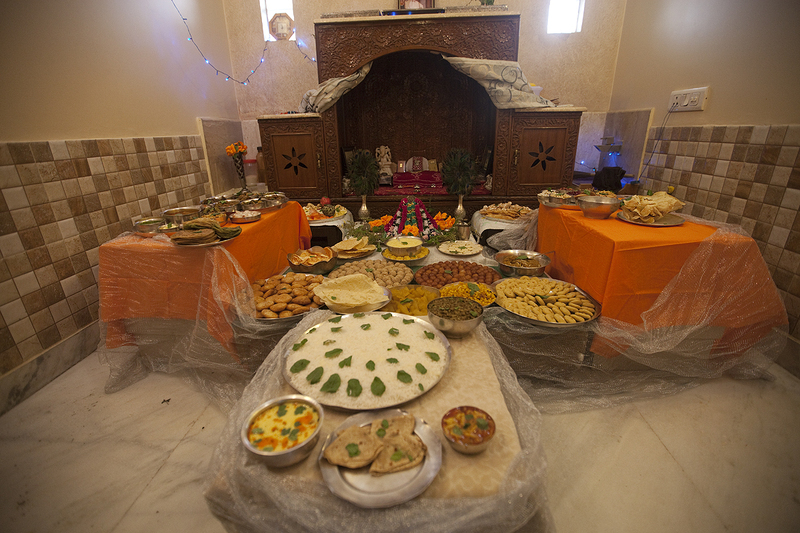 All the food cooked is placed before the God and a mound of cooked rice, symbolic of Mt. Govardhan, is placed in the center. Everybody then sings prayers and kirtan praying to God to accept them. This lasts for almost two hours and then this sanctified prasad(food) is eaten by all the devotees. The amount of work that goes into making all the food and then serving to everyone makes me wonder how God gives us all the energy to do this. By the end of the day every one is just plain tired like hell.